The Wyoming Geographic Information Science Center (WyGISC) is an interdisciplinary research institute at the University of Wyoming focused on the development of geospatial information and technologies and their applications in science, education, government and business. Mission. WyGISC's mission is to advance the knowledge and application of geographic information science and technology through research, education, and service. 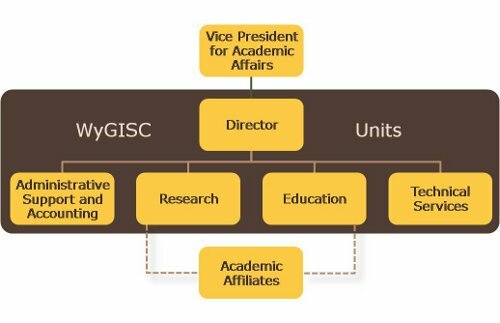 WyGISC aspires to become a premiere interdisciplinary academic center in geographic information science research and education, while strengthening our unique leadership role in service and outreach to the university, state and region. Expertise and Capabilities. Disciplinary specializations among WyGISC personnel range from geography and urban planning to ecology, geology, hydrology and natural resource management. Technical expertise includes spatial database design and development, remote sensing and image processing, geographic analysis and modeling, application programming, and GIS program management. WyGISC's research and development activities are broad, from geospatial data collection and spatial database design and development, to environmental modeling and Web-based geographic query and visualization implementations. The Center's education, training and information and technology transfer activities further support the adoption and use of geospatial data and information technologies among a wide range of end-users in academia, government, business, and the general public. Examples include the Wyoming GeoHub geospatial metadata registry and Spatial Technologies Short Course Training Program. History. The Center had its early beginnings as the Spatial Data and Visualization Center (SDVC), established in May 1996 as a campus research cluster with funding from the National Science Foundation's (NSF's) Experimental Program to Stimulate Competitive Research (EPSCoR). The primary goal of the original research program was to explore and demonstrate the utility and application of spatial data analysis and visualization science and technology in a decision support role for resource management and economic development activities in government and industry alike. In August 1999, a newly approved university-wide academic plan identified the SDVC as the future focal point for expanding GIS capacities and competencies throughout campus to provide critically needed course work for undergraduate and graduate students and to serve as a resource for businesses and government agencies. In 2001, the SDVC was institutionalized as the Wyoming Geographic Information Science Center (WyGISC) operating as an academic unit within the structure of UW's Office of Academic Affairs. Funding. Approximately 15% of the Center's annual fiscal resources derive from the University's general operating budget, through the Office of Academic Affairs. These funds primarily support curricular teaching responsibilities among WyGISC academic personnel, management and accounting, information systems infrastructure (hardware, software, networking), and research & development program development (e.g., grant writing). Over its history, other university programmatic support has been provided by UW's Office of Research & Economic Development and NSF EPSCoR Program. The remainder of the Center's operational budget is funded by a combination of on-campus partnership agreements and extramural contracts, grants and cooperative agreements, which typically support personnel activities and information / technology transfer associated with project-specific deliverables. Organization. WyGISC's Director reports to the UW Provost and Vice President for Academic Affairs. Center personnel include university and project-funded research scientists, office and support staff, students, and contract employees. WyGISC collaborates with a number of individual academic affiliates both at UW and in other organizations across the United States and around the world. WyGISC & UW. Over the last decade, WyGISC has lead the establishment of geographic information science as one of the University of Wyoming's Areas of Distinction, not only as a critical area of science and technology related to energy, earth and computational science, but also through its significant contributions to place-based planning, management, and problem-solving in the environment and natural resources arena. Along with its formally established Academic Affiliate collaborators, WyGISC works closely with faculty in a wide range of academic programs across numerous colleges and schools on campus. Examples include the departments of Botany, Geography, and Renewable Resources, the Haub School and Ruckelshaus Institute of Environment and Natural Resources, the interdisciplinary Program in Ecology, and the College of Agriculture's Agricultural Experiment Station. The Center's potential to foster excellence in academics extends to anticipated work on building cyberinfrastructures and science information systems through collaborations with the National Center for Atmospheric Research, UW's Berry Center for Natural History and Conservation, and the proposed Forest-Steppe and Tundra Ecotones Research Observatory. Beyond academics, WyGISC has already begun to support excellence in UW's capital facilities and infrastructure via application of geographic information data and technologies in property and facilities management and in site planning and design for long-term campus building and development. WyGISC has and will continue to support UW's commitment to promoting access to higher education Activities include its professional short course training offerings, geospatial technical assistance with enrollment management, and articulation with community colleges offering coursework in geographic information systems and related geospatial technologies. State & Regional Service. WyGISC continues to provide leadership to the Wyoming geospatial community, advocating for coordinated development of a statewide spatial data infrastructure and supporting standards and policies for data development, sharing and stewardship. Center staff have consulted with the Wyoming Governor's Office and the Wyoming Office of the Chief Information Officer. Other service includes participating in such efforts as the State GIS Technical Advisory Group (and its predecessor the Wyoming Geographic Information Advisory Council), the ESRI GIS Southwest Users Group, and the Rocky Mountain Chapter of the American Society for Photogrammetry and Remote sensing. WyGISC's leadership role extends to the education and training of the State's future GIS professionals and practitioners who will be working in economic and community development, engineering, energy resource development, or natural resource management. National Affiliations. WyGISC participates with other UW units as a member of the University Consortium for Geographic Information Science. WyGISC is also a member of the AmericaView Consortium for remote sensing education and research. WyGISC researchers also hold individual memberships in various professional organizations, including the American Society for Photogrammetry & Remote Sensing, the Association of American Geographers, and the American Planning Association. Several WyGISC personnel are currently certified as "GIS Professionals" (GISP) by the Geographic Information Systems Certification Institute. International Connections. In recent years, WyGISC has substantially increased its international research activities, including significant work in Australia and Central Asia. WyGISC remains committed to strengthening existing international collaborations and capitalizing on opportunities for building new linkages with our interdisciplinary GIScience expertise. Such efforts could also contribute to UW's broader commitment to international undergraduate and graduate education programs. A member of the Center staff also serves as a certified project manager for the United Nations International Charter on Space and Major Disasters.